The tiny squeak of a hamster can be such a cute noise to hear, but it's not always a good sign. Hamsters squeak whether they're happy or annoyed, hungry or lonely. In other words, it can be tricky to determine whether or not a squeak is something to be concerned about. However, you can look for other signs that might tell you what's wrong. With a bit of inside knowledge on hamster lingo, you can learn what your hamster is trying to say. An occasional squeak is nothing to be alarmed about. This is usually when your hamster is trying to tell you something. However, a persistent squeak should not be ignored. For example, if you have two hamsters housed together, the frequent squeaking from one or both of the hamsters could be a sign that they aren't getting along. With observation, you can come to understand what your hamster is trying to tell you when he squeaks. A persistent squeak can be your hamster's way of saying, “Back off.” He may do this when around other hamsters or, if he's new to your home, may do this when you try to pick him up. If your hamster is new, socialization is key to making your hamster feel calm. 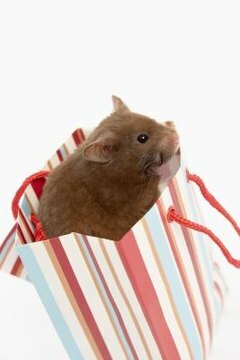 Once socialized, there's less of a chance that your hamster will squeak out of annoyance. If he does, pay attention because he doesn't like something you're doing. Look for signs of annoyance, such as puffing up or hissing. Your hamster may also squeak when he needs attention. This might just mean that he wants out of his cage and wants to spend time with you. Anytime you hear your hamster squeak persistently, check in on him to make sure everything is okay. Check his food and water. Make sure his habitat is clean. More importantly, if the squeak is persistent, make sure his isn't injured by doing an overall body check.